William Roe Polk (born 1929 in Fort Worth, Texas) is a veteran foreign policy consultant, author, and relation of president James K. Polk and of the prominent lawyer and diplomat Frank Polk. He is a former professor of history at Harvard University and the University of Chicago, and was President of the latter's Adlai Stevenson Institute of International Affairs. 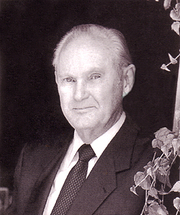 William R. Polk is currently considered a "single author." If one or more works are by a distinct, homonymous authors, go ahead and split the author. William R. Polk is composed of 6 names. You can examine and separate out names.